Buffalo scored three unanswered goals to come back from a 2-1 deficit to beat the Bruins 4-2 on the back of Ryan Miller‘s 38-save effort and Thomas Vanek‘s two-point night. Tuukka Rask played pretty well but continued to have some bad luck and bounces bite him in the end. The Bruins began the game by continuing to exert their will on the opponent by letting their legs create chances early in the period. The passing game was especially sharp in the on-going but the Bruins forwards often lacked the ability to finish. Their passing would turn Ryan Miller inside out but either the last pass was broken up or the shooter missed a good chance. The Bruins would take the game’s first penalty but that was soon cancelled out when Buffalo sent a player to the box just 28 seconds later. The Buffalo power-play had been on fire coming into the game so the missed chance really wore on Buffalo. From there the Bruins really started to dominate the game but couldn’t find a goal on their next power-play. Marc Savard showed some flashes of great passing but a chance never really introduced itself very well. However, on the shift after the penalty expired the Bruins got themselves on the boards. Dennis Seidenberg fired a shot on net and Nathan Horton did a beautiful job of creating a screen in front of Miller. No Sabre decided to clear Horton out and Seidenberg was given a chance to fire on net and it snuck just past Miller and in for the game’s first goal. The Sabres would get a chance to tie later in the period, on their first full power-play of the game and despite their small, fast forwards flying around and keeping the puck for most of the power-play the Bruins were able to kill the penalty and ensure the lead into the first break. The Sabres would strike early in the second period when Cody McCormick raced through the zone and fired a shot off the post. The shot beat Tuukka Rask clean and rang pipe on the ice surface then ricocheted out at an angle in which McCormick was already skating. McCormick got the rebound on his tape and fired it home into the now gaping net. The Bruins would come back and get the lead again when the fourth line finished a great shift with a Gregory Campbell goal. Shawn Thornton made a steal and couldn’t get a shot off, after a nice bit of work in the corner he kicked it out to Blake Wheeler in the shot who then made a nice touch pass to Gregory Campbell on his right who one-timed it home. The Sabres, finally finding their skating legs, began to capitalize on the Bruins inability to move the puck out of their zone and began to test Rask more often. The Sabres would get another power-play in the middle of the period. 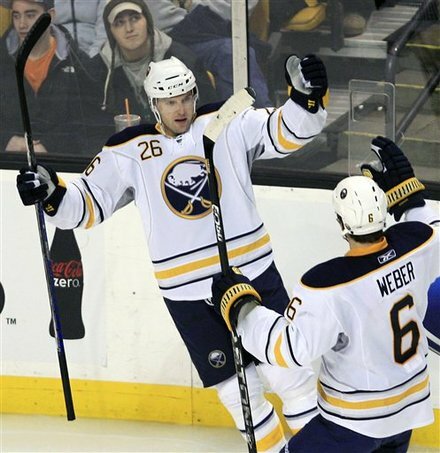 After some short-handed chances put a scare in the Sabres they finished the power-play with a goal when Tyler Myers looked off Rask before finding Nathan Gerbe on the opposite side for the one-timer. Myers hesitation got Rask to commit to the shot and was helpless to get over in time to make a save on Gerbe. The teams finished the period with spirited rushes both ways, both looking to grab a lead going into the third period but neither team could get one past the goalie. The Bruins nearly got the go-ahead goal when a rebound went under Miller and was scraped off the goal line by Steve Montador in the first minute of the period. The Sabres would hold off the Bruins early pressure and get the go-ahead goal for themselves a few minutes later when Thomas Vanek scored on a 2-on-1. Vanek got the turnover and raced up the right side, he looked off Rask long enough and then fired short side beating Rask glove side high. The Sabres would go into a defensive shell for most of the period, choosing to protect their goal at the expense of creating offense. Ryan Miller did a great job of protecting the lead despite the Buffalo defense leaving him out to dry many times. The Sabres did manage to counterpunch on turnovers, the shining example being Jason Pominville‘s goal with 3:20 left in the period. Steve Kampfer fell down in the offensive zone, leading to a 3-on-2 the other way. Thomas Vanek carried down the left side and was able to pass to Pominville as he crashed the crease, pushing the puck under Rask for the insurance. The Bruins pulled Rask with two minutes left, needing two goals to draw even. Buffalo would get called for cross-checking with just under a minute left in regulation, giving the Bruins a little hope. Buffalo did a good job of stifling the Bruins at the blue line and Miller continued to be the best player on the ice and the game went Buffalo’s way. The Bruins will next play the Avalanche in a matinee game on Saturday.